The Cincinnati Historical Society officially formed in 1963. Prior to this year, a Cincinnati Historical Society, dating from 1844, existed, but it eventually merged with and became known as the Historical and Philosophical Society of Ohio. The Historical and Philosophical Society of Ohio originated during the nineteenth century. It was a predecessor of the present Ohio Historical Society. The first attempt to create a historical society to document Ohio’s history occurred on February 1, 1822, when the state legislature enacted an act creating the Historical Society of Ohio. This society only held one meeting and included such Ohio dignitaries as Jeremiah Morrow and Duncan McArthur. In 1831, the Ohio legislature directed Benjamin Tappan to establish the Historical and Philosophical Society of Ohio. This organization first held meetings in Columbus, and its participants actively documented Ohio’s past. Unfortunately by the late 1830s, interest in the society declined. A principal reason for this was the Panic of 1837 and the difficult economic times that accompanied it. Between 1841 and 1848, members convened meetings only twice. In a meeting held in 1848, Salmon P. Chase suggested that the Historical and Philosophical Society of Ohio move from Columbus to Cincinnati. Cincinnati had a larger population, and hopefully its residents would be more willing to participate in the organization. The society merged its collections with that of the Cincinnati Historical Society. Together, the organizations prospered. By 1874, the Historical and Philosophical Society of Ohio had more than seventeen thousand books in its library and enjoyed an endowment of more than eight thousand dollars. Unfortunately, the Historical and Philosophical Society of Ohio eventually became more of a gentleman’s club. Only members of the society could access its library. Beginning in the 1940s, a movement arose to broaden the society’s membership and to open its archives to the general public. The society also began to emphasize Cincinnati history in its collections, rather than collecting documents and artifacts from across Ohio. As a result of the group’s change in focus, the Historical and Philosophical Society of Ohio changed its name to the Cincinnati Historical Society in 1963. Over the years of the Historical and Philosophical Society of Ohio’s and the Cincinnati Historical Society’s existence, its library has been housed in numerous locations. Following the American Civil War, the society was located in the Cincinnati College Building. The library eventually moved to a building on West Eighth Street in Cincinnati, before relocating to the University of Cincinnati’s library in 1901. 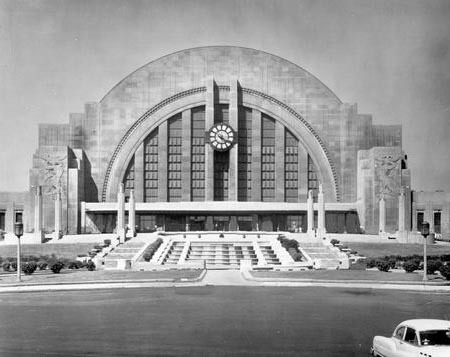 In 1964, the Cincinnati Historical Society occupied a wing at the Cincinnati Art Museum, and in 1991, the group moved to its current location at Union Terminal in downtown Cincinnati.